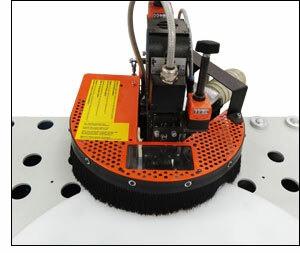 A machine for the trimming of straight or profiled workpieces edged with material up to 3 mm thick. A great partner for the EBM KDP111F and 111FL shaped edgebanders. The FRF130 comes equipped with two 0.5HP high frequency motors running at 12000rpm which are powered by a static invertor. Each motor is equipped with a milling block with 4 reversible 3mm radius TCT tips (other sizes on request). Each motor has individually adjustable tracing wheels for trim adjustment and fully adjustable side tracing wheel to ensure a constant profile along the trimmed edge. The top and bottom motors have pneumatic vertical movement, operated by a footpedal, to enable a panel to be introduced into the machine without damaging the edging material. In-built dust extraction assists with the cleanliness of the machine and the surface of the panel and helps ensure the quality of the trim. The machine is mounted on wheels for use in smaller workplaces.